The Hinkley Plantation designer 4 light pineapple glass open chandelier finished in antique nickel, a quality pendant light with with stunning classic features, supplied by Elstead Lighting and designed by Hinkley. The glass has been deeply cut and forms the shape of the Pineapple which will catch the light and create a sparkle when lit. Not only a feature, this glass is illuminated and the off white shades are held in place, again with rosette finials. Throughout the Plantation lighting range, each part of the fruit has been utilised in the overall design, Each of the lamp holders hold highly detailed rosettes in a circular arrangement of leaves budding from cast polished nickel segments. This single tiered Plantation chandelier holds three arms surrounding the centre light within the glass. Finished in a polished antique nickel creating a wealth of traditional charm. An absolutely remarkable feature lighting range incorporating the pineapple. 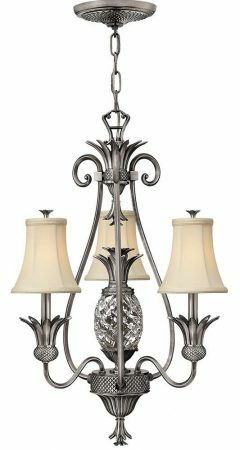 There are so many exotic fruits to choose, yet the pineapple has for centuries appeared in numerous traditional lighting styles and in all honesty looks aesthetically in place. But why the pineapple? And why is it traditional? In 1642 on Christopher Columbus’s second voyage across the Atlantic, he and his crew went ashore to explore the Caribbean Island of Guadaloupe, it was deserted, but they found stores of recently picked fruit and vegetables, amongst these where large prickly fruits that they had never encountered. The taste was sweet and delicious. Sugar and sweet tasting food was such a rare commodity in those days, only Royal’s and the extreme wealthy could enjoy these, and so the pineapple became a statement of wealth, it’s image became a monument of this symbol and it’s image soon started to appear in household designs such as lighting and stone features to adorn the residence of the wealthy. 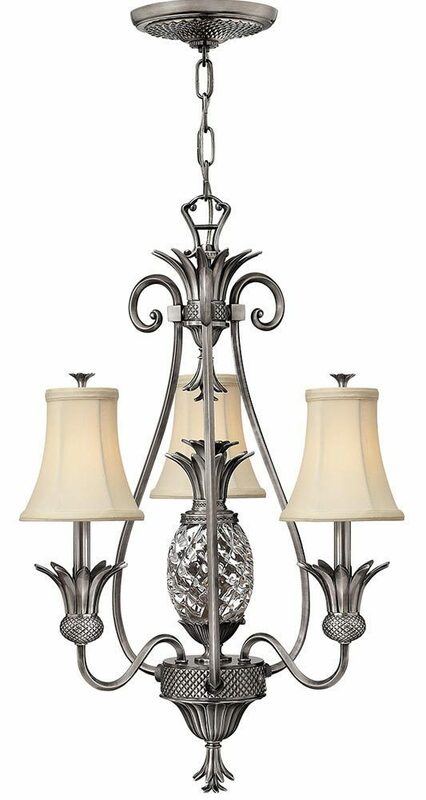 The Hinkley Plantation designer 3 light pineapple glass open chandelier finished in antique nickel is designed in the USA by Hinkley Lighting, founded in 1922 in Cleveland, Ohio. They have transformed from a small outdoor lantern company to a global brand intent on bringing you the best in style, quality and value. Their long heritage combines with a pursuit of innovative design to create modern and contemporary lighting to illuminate what you treasure most. The switch is located on the bottom of the centre light, and cycles through Off/All On/Outside Lights On/Centre Light On/Off.